An inactive life is worse than a cigarette-filled one. 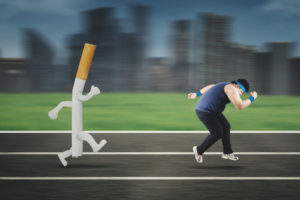 Skipping exercise may be more damaging than smoking cigarettes, according to a study published in the journal JAMA Network Open. Researchers at the Cleveland Clinic studied 122,000 patients on treadmill tests from 1991 to 2014 and compared their mortality rates. The results showed higher levels of exercise, especially cardiovascular fitness, results lead to a longer, healthier life. Basically, an inactive life is like having a serious disease. The cure, get off the couch. Scoring unfit on a treadmill or exercise fitness test is more detrimental than having diabetes, hypertension or smoking, the study revealed. “Extremely high aerobic fitness was associated with the greatest survival and was associated with benefit in older patients and those with hypertension,” according to the study. What’s your favorite exercise? Let us know in the comments section of Facebook! This entry was posted in Culminant Health, Disease by Senta Scarborough. Bookmark the permalink.